The Agilent U2701A and U2702A USB modular oscilloscopes combine a set of essential features that are ideal for analyzing designs in an affordable way. 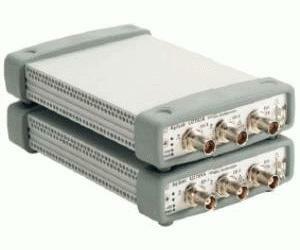 The U2701A and U2702A come in two bandwidths: 100 MHz and 200 MHz respectively. These devices are uniquely designed to accommodate your needs for flexibility with the dual play function. Dual-play functionality allows you to use the oscilloscope as a standalone or to scale up the test system in a card cage with additional scopes or with Agilent s other USB modular product offerings, thus providing a complete solution for system development. The U2701A and U2702A give you the debugging power you need. Each modular oscilloscopes comes standard with features such as advanced triggering, automatic measurements, math functions including FFTs, and much more. The user-friendly Agilent Modular Instrument Measurement Manager software bundled with the U2701A and U2702A offers a simple interface for quick setup, confi guration, and measurement control.